Art students are provided many study abroad opportunities through FSU International Programs. With opportunities to work closely with faculty from the Department of Art, Department of Art History, and other institutions, our students benefit from a broad range of related course offerings including art, design, and art history in numerous locations worldwide. Study abroad offers many benefits to the art student ranging from first-hand study of important examples of art, architecture and design to exposure to international cultures, lifestyles and languages. 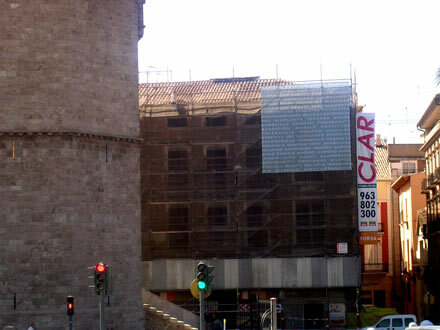 Pictured below is a banner project created by Associate Professor Terri Lindbloom for the new FSU International Study Abroad building situated in the heart of the old historic section of Valencia, Spain. It consists of words taken from different languages expressing kindness or gentleness. The piece was installed from September 2006 to January 2007. It was funded with the assistance of an FSU COFRS grant.